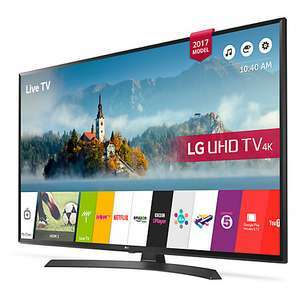 Just testing waters before i pull trigger need a new TV and this fits bill really want an LG but a lot have the 2 feet at either end this one has stand in middle so would hopefully fit on my cabinet. Beware, the viewing angles on this (I had the 630 V, same tv, different stand) are rubbish. If you ain't sat right in front, it ain't bright enough. Is this a misprice? Crazy. Refresh rate 50hz. Surley that's a typo. Great deal, my brother has an LG TV, looks fantastic. £539 at most places. Decent set and size for the price. John Lewis’ 5 year warranty sweetens the price. This is probably the best TV in its range along with the Samsung 55MU6400 which is £600+. The difference between the 2 other than price is the LG has an IPS panel and the Samsung has a VA. The VA has slightly better images and colour but only if you sit directly in front of the TV. The IPS has a wider field of view so wont lose its colour if you move off centre. There isnt a right choice only personal preference. Both TV's punch above their weight for their price. Brought this set on Monday for my mum. No problems so far and looks great. No, every TV at this price is 50hz (and will do 60hz as well for stuff like game consoles). No, every TV at this price is 50hz (and will do 60hz as well for stuff …No, every TV at this price is 50hz (and will do 60hz as well for stuff like game consoles). So I won't see screen tearing on my ps4? Struggling to find reviews for this. I'm guessing it's only 8bit HDR and a 3k panel (ie RGBW) at this price? My mums LG failed after 23 months, before I threw it, I opened it up, touched each connector and it fired up again. 3 years later, it failed again (picture went stripey) but was fixed at some cost. It still works today but so does my Bravia and Phillips which needed nothing doing in the same time frame. All HDR is 10-bit, but this doesn't even have a wide gamut so it's won't display HDR much different to SDR. Doesn't show up on Game website as in stock. Which is better the LG 55UJ635V or the Samsung 55MU6400? Samsung for sure. I have it on price match at JBL for £569. When it's back on stock I'll get it. How about the Samsung 55MU6220? I got it from AO for £494 (hasn't arrived yet but am really happy with the deal). How does it compare with this? It's the right spec and price but the stand looks ugly. How about the Samsung 55MU6220? I got it from AO for £494 (hasn't arrived …How about the Samsung 55MU6220? I got it from AO for £494 (hasn't arrived yet but am really happy with the deal). How does it compare with this? That Samsung appears to be 8-bit with no FRC. This LG uses RGBW. Excellent picture via the HD channels on this TV. Worth buying via John Lewis for the 5YR warranty and customer service. The Samsung is £629 at Argos cheapest I can find it. Plus buy any of Samsung: all in one soundbar £200 , wireless subwoofer £200 or UHD Blu Ray player £100 and you claim it all back from Samsung = £500 worth of stuff for free (maybe not worth £500 but still a soundbar, wireless subwoofer and blu ray player) and you only pay £629 total. Seems like a better deal than just the LG tv, even if you sold the extras the tv would cost you way less than the LG. Samsung are doing a cashback promotion so if you can afford to initially …Samsung are doing a cashback promotion so if you can afford to initially spend an extra £100-£500 I'd think you're better off going for the SamsungSamsung UE55MU6400 £629 at Richer Sounds with 6 year guaranteePlus buy any of Samsung: all in one soundbar £200 , wireless subwoofer £200 or UHD Blu Ray player £100 and you claim it all back from Samsung = £500 worth of stuff for free (maybe not worth £500 but still a soundbar, wireless subwoofer and blu ray player) and you only pay £629 total. Seems like a better deal than just the LG tv, even if you sold the extras the tv would cost you way less than the LG. This isn’t correct. The cash back doesn’t cover the cost of any of those three items individually, let alone all three. I paid £497 a couple of weeks ago from Argos for the 635V. For me its a great TV, loads of features and the 4K videos I've tried look almost 3D they are that clear. I have NOWTV passes, and this has the app built in also. Plus FreeviewPlay, FreeSat and a host of other great apps. I have a 4k hdr sony and i hate the laggy android operating system on it. I want to get either an LG or samsung to replace it. Well, if you want the cheapest option, the LG should be good enough, the Samsung just has better picture quality. Samsung for sure. I have it on price match at JBL for £569. When it's back …Samsung for sure. I have it on price match at JBL for £569. When it's back on stock I'll get it. I have a 4k hdr sony and i hate the laggy android operating system on it. …I have a 4k hdr sony and i hate the laggy android operating system on it. I want to get either an LG or samsung to replace it. I have an LG currently- great tv. Stand looks naff and the tv wobbles loads. Here, FRC is a type of dithering to approximate the extra colours that can be found with 10-bit colour (it pretty much tricks your brain). If you're not watching 4K HDR content, there won't be any difference as it won't support 10-bit colour.